Slippery Rock University's Bachelor's in Accounting program features an integrated curriculum that focuses on developing knowledge while enhancing communication, critical thinking, and problem-solving skills. Our accounting majors also increase their technological proficiency as it relates to the business and accounting world. With a degree from SRU, you'll be prepared for success in this challenging and rewarding field. At SRU, the accounting program emphasizes learning through research and practical application as students prepare for the Uniform Certified Public Accountant Examination and careers in public accounting, government, and private industries. You can also further your professional growth through participation in our many accounting-focused student organizations and clubs. Accounting majors participate in many career development programs offered through the School of Business such as the Finance & Economics Club, Student Accounting Society, and Alpha Kappa Psi. Members of these groups and other accounting-related organizations on campus also sometimes travel to conferences across the country! As an accounting major, you'll learn about a variety of software programs used by accounting professionals that provide realistic application of practices and procedures in an environment that simulates the workplace. You'll also have a chance to study abroad and earn course credit while learning in countries such as Italy, Ireland, and Spain. Furthermore, SRU's School of Business can help students find available internships that provide the hands-on experience that employers are looking for. Accounting internships can also count toward elective requirements! Learn more about our Accounting major! Slippery Rock University's Bachelor of Science in Accounting program gives students the tools they need to succeed in the evolving business world. Interested in learning more about SRU's Accounting major? Request more information today! Andrea Byrd majored in Accounting and Finance with a minor in Information Systems. She chose SRU because of her family legacy with the university. While at SRU, Andrea has served as President of the Student Accounting Society and Alpha Kappa Psi business fraternity among other leadership roles. She has also been able to travel to Italy to study abroad. 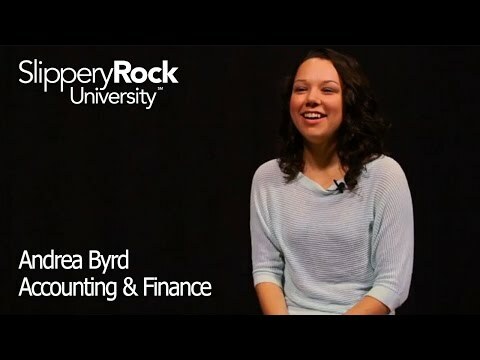 Andrea feels that SRU prepared her for the CPA exam and to be successful in the modern business world. Finance - Related quantitative analysis.